2014-15 Panini NBA Hoops Basketball gives collectors the first wide release featuring rookies from the deep 2014 NBA Draft. After experimenting with a jumbo box configuration last year, it's back to a more traditional set up. Hobby boxes deliver a pair of autographs, a memorabilia card and plenty of rookie, inserts and parallels. The base set features a mix of veterans and the loaded rookie crop slated to debut in 2014-15. With 36 rookie cards per hobby box, each pack should have at least one. Parallels include Gold, Green and Artist Proof (#/99). At least one of the promised autographs comes from a first-year player. Every case, which comes with 20 boxes, has a signed card from either Andrew Wiggins, Jabari Parker or Marcus Smart. Each case also has three autographs from Dante Exum, Doug McDermott, Elfrid Payton, Joel Embiid, Shabazz Napier or Zach LaVine. 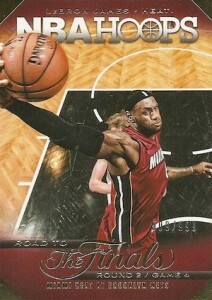 Red Hot Signatures (#/25) is a new autograph set that mixes current, retired and rookie players. At least three boxes per case come with a third autograph. 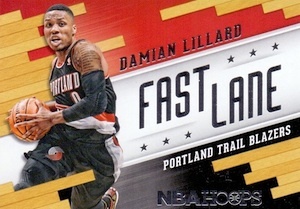 Basic inserts in 2014-15 Panini NBA Hoops Basketball combine with parallels to land 72 per box. A minimum of ten of these are serial numbered. Road to the Finals covers the entire 2014 postseason. Every game from the first round through to Game 5 of the NBA Finals where the Spurs knocked off the Heat has a card in the massive set. 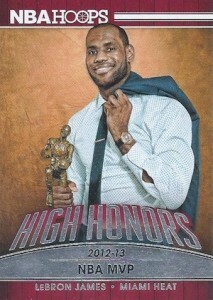 Portraits of the Championship-winning San Antonio Spurs are also included. 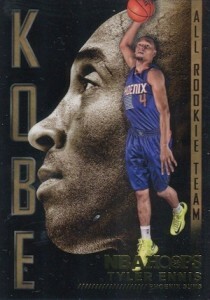 Kobe's All-Rookie Team returns as one of the product's tough inserts. The cards land approximately one per case. 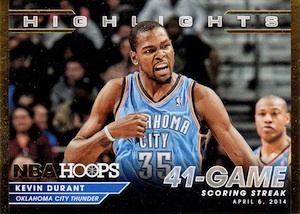 Highlights is another basic insert that is hard to find. ANDREW WIGGINS 2014-15 Hoops RED Parallel Rookie RC Card BGS 9 MINT #'d 299! 300 cards. Shop for base sets on eBay. 1:370 packs. 1 per case. Good: Nice photography, straight forward, first look at 2014-15 rookies, affordable. Bad: Way too many insert sets. 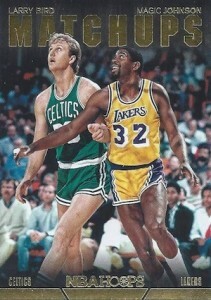 The Bottom Line: After a year with a jumbo pack format, NBA Hoops is back to a more traditional configuration. 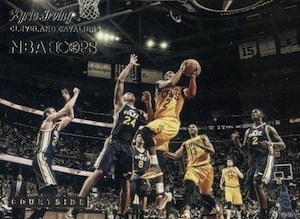 With a focus on fun and an extensive checklist, it kicks off the new basketball card season with some great images, solid designs and lots of inserts. Lots of inserts. As always, the cost of entry is reasonable and there’s plenty to chase at all price points. I like the look of Hoops a lot this year. It’s not flashy. Focusing on photography on the front and player information on the back, it’s what I expect from an entry-level set. The essentials are all there and you get to see some cool shots in the process. As a whole, the parallels are distinct. The shimmering edges of the Gold cards are particular standouts. However, the Red Backs return. I’m a big believer in not having to turn a card over to know that it’s different — unless it’s an old tobacco card or modern minis that borrow from the old way of doing things. If you’re a stickler for sticker autographs, that’s what the Hot Signatures use. While it’s never preferred, they are integrated into the design. On the down side, they’re on foil so it’s pretty hard to hide. The best basic inserts are the ones that focus on unique images like Lights…Camera…Action. Others, like Class Action and Moments of Greatness are extremely busy, either with huge borders or backgrounds, that make it hard to focus and appreciate. The base set is about all you could ask for. The checklist is big, there are plenty of rookies and no short prints. It’ll take multiple boxes to finish, but it’s doable. 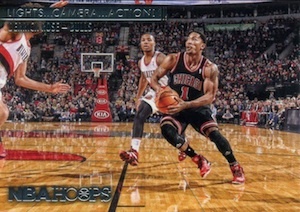 Where 2014-15 Panini NBA Hoops falters checklist-wise is with the sheer number of insert sets. Not counting parallels, I got 16 different types of inserts out of a 24-pack box. That’s far too many. It does give collectors a chance to pick and choose the ones they like, but taken as a whole, it’s overwhelming. 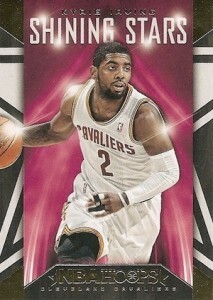 One major standout for me in the set is the massive Road to the Finals set. Covering every game of the postseason, it has a nice historical feel. The tiered structure based on the various rounds is a neat feature too. It adds to the challenge but not in a way that makes it impossible to finish. 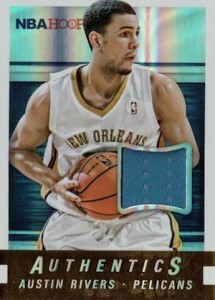 2014-15 Panini NBA Hoops isn’t an expensive box. Given all the content, a guaranteed autograph and many numbered inserts, the complete package is reasonable even if you don’t land a major autograph or memorabilia card. 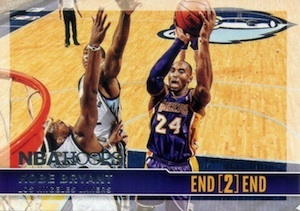 Panini has also done a nice job with several of the short print basic inserts like Kobe’s All-Rookie Team to add a little extra. The parts of Hoops I liked, I really liked. And even the over-abundance of inserts didn’t do too much to dampen the experience. As much as I like bust jumbo packs, this wasn’t the right type of product for it like was done last year. It meant an even greater ratio of inserts and a lot of predictability as far as placement. The base set is great and has a good comprehensive feel. A handful of the inserts I’m contemplating building the set. 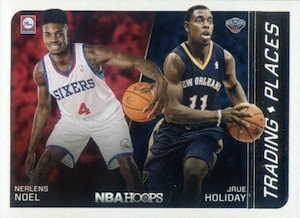 2014-15 Panini NBA Hoops is just a well-rounded set. The box used for this review was provided by Panini. Hoop Hoop! One of my favorite releases the last couple of years. 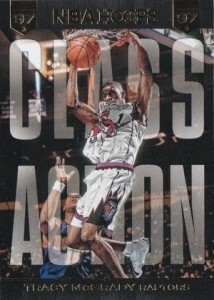 Lots of action shots, nice court side photos, neat looking inserts and lots of cards for not a lot of paycheck. Always a fun break, especially for a basketball fan or collector who is just as happy to get a base/parallel or insert card of their favorite players as they are a “hit”. Basic Panini garbage-again! They could do so much with all this talent, but again rely on black back round pictures of the future stars of basketball. No league leaders-again. Typical Panini disappointment! Always a treat, with great action photos and inserts. Really well-done set, and a fun break. David….the rookies haven’t even played a game yet…..what are you expecting? 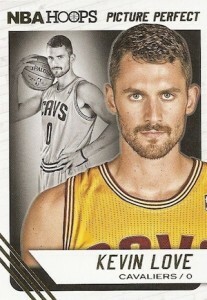 Initially, I like the Panini Hoops version. But each year, it dwindles in terms of collection attributes that has enticed many buyers before. The primary target: low end collectors, beginners and casual collectors. Last season going to Jumbo has spurned many collectors and hopefully the traditional format would allow others to go back to this again. The only good thing about 2014 Hoops is for Spurs fans. 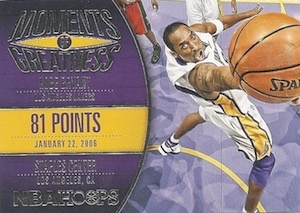 This is the only set that utilized the road to the Finals. If you are a true Spurs fans then this is a must. Heck, you should be buying in cases. 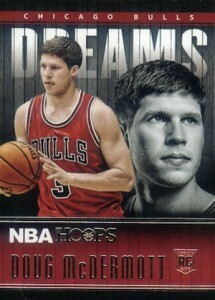 A Spurs-centric product should feature the champion cards mixed with rookie cards. The design has improved a little bit, but the inserts are still horrible. 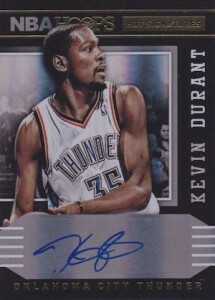 Hologram/Prizm cards should be inserted as inserts. Overall: Great for Spurs fans, Good for casual collectors, Horrible for high end collectors. 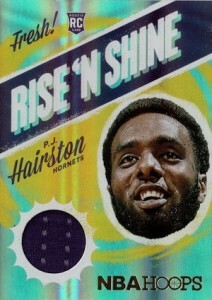 I liked Panini Hoops in the product’s first few years but these last few years Panini has been ruining it, IMO. It was fine the way it was, they didn’t have to make jumbo packs. Panini says this is for low end collectors? And I assume children since it’s the very first product for the upcoming 14’15 NBA Season yet a box is slated to go for $96.22? Are you kidding me, Panini? That is NOT a low end price for a product you deem “low end”. I usually look forward to picking up a box of Panini Hoops to get base RCs since there are no more products like Bowman Draft Picks & Stars for basketball collectors. But there’s no chance I’m paying $96.22 for a box of 14’15 Panini Hoops. NO THANK YOU, Panini! I think they over did it on the inserts. Some of these dealers will have a hard time filling their pre-sell orders, for Master sets. I think the high price of the boxes is more the fault of money hungry dealers trying to make a quick buck, rather than Panini. Supply and demand drives the market, be patient and the price will fall. Someone please explain why some cards in the base set have 2 players listed for that card number. Not a high end product at all, so why would one compare it to one? A great value and break. For $80 at our shop, we’ve had no complaints (except that Panini can’t spell) and a few repeat customers. I just don’t get the haters with this product. and dupes I could care less about now. Plan old flash back look! 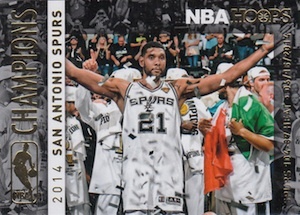 The 2014-15 NBA Hoops Basketball Cards more proof of just how Panini is making cards worthless. This set has a Main set, 4 parallels of the main set plus 27 insert sets! Yes that’s right 27 insert sets, each from 20 to 60+ cards! 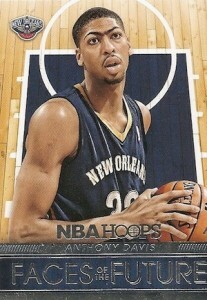 What a joke for a set that looks like a very old version of NBA hoops by another card maker! What’s a matter can’t come up with anything original! 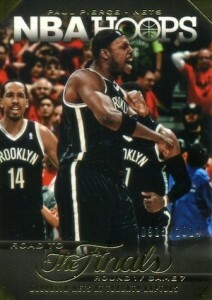 Happy over paying for this worthless set of basketball card. Panini just doesn’t get it! Hopefully some of their other offering in 2014/2015 will be a better value, more artistic and not so impossible to complete a set. Even the new collector know with so many inserts sets and parallels of the base set, plus they short prints of a lot of cards your chances of completing this set are near to none, unless you drop a lot of money! Which is all that Panini cares about! Wise up collectors, they are making your cards worth less and less. 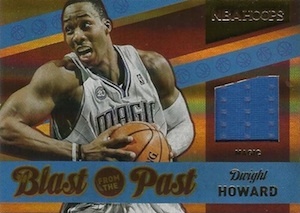 The 2014-15 NBA Hoops Basketball Cards offers nothing worth collecting. Got a box for $60. Good value in there, except too many inserts and parallels. I only got about half the complete set and didnt even pull an Andrew Wiggins RC. I was able to trade some of the inserts and parallels to finish my set though. The base cards are nice for In Person Autographs and Through The Mail Autograph requests. The Rookie Cards have a black background which isnt as appealing. Photography is great especially on the lights, camera, action and courtside inserts. Foil is nice on base and inserts. Chances for nice autos and low numbered cards. heapsa cards to chase and fun to open. Not high end but it doesn’t profess to be. I have bought four of the twenty dollar boxes of these and have pulled some pretty decent cards. I pulled a Doug Mcdermott autographed rookie card, a adriene payne rookie jersey card, a kawhi leonard jersey card, and a kemba walker jersey card plus a andrew wiggins, jabari parker, and joel embiid rookie cards plus lots more. I have no complaints. A very nice set of cards for collectors who dont want to spend a bunch of money. Entertaining set with some attractive inserts and parallels. Definitely more for the casual collector or low-end hobbyist (like me). I do agree that they overdid it on the volume of inserts. Also, I don’t find the base set attractive, especially the backs of the cards. The bland black or red doesn’t do it for me. But if you’re just getting into collecting or you’re young and/or cheap, this is decent NBA option. Ryan, another great review! This is the best Hoops product in years! I love the parallel inserts especially the green x-fractor like cards—wish they were a little harder to pull or serial numbered (I would suggest switching the green instead of the silver serial numbered). With respect to the bang-for-the-box, this product is definitely worth it. I have been selling the complete sets for $44 (which are sold usually in less than a week), and some of the insert subsets I have sold for $20. 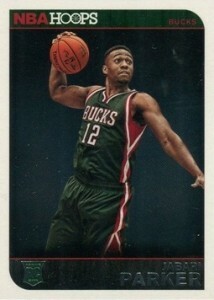 The Wiggins green parallel sells for $12-15 within a week. Just a great value—hopefully next year’s Hoops is just as good. Awesome product for all collectors! Great photography, cool inserts, autographs, game used! Whats not to like. The way collecting is supposed to be.